While most of us along the Atlantic Coast keep our eyes on Tropical Storm Erika churning in the Caribbean, Upinraaq (named for the Inuvialuktun word for summer) the whimbrel has already met with the storm in the middle of the open Atlantic. Upinraaq, wearing a tiny tracking device, was migrating south from Newfoundland to South America when she crossed paths with Erika nearly 1,000 miles east of the West Indies. 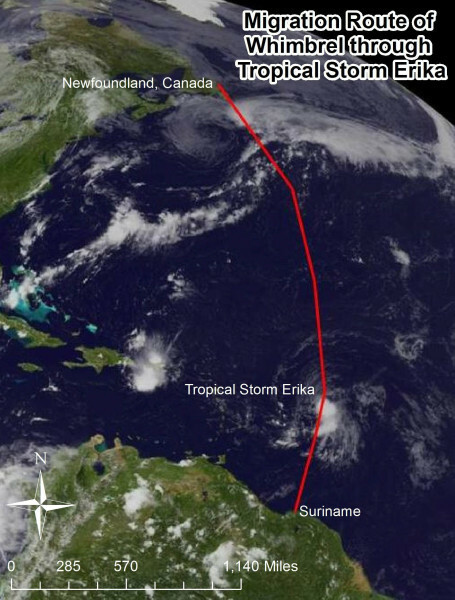 Erika was a developing tropical storm with sustained winds of 46 miles per hour when the encounter occurred. Amazingly, Upinraaq had been flying non-stop for more than 3 days and 2,700 miles (4,300 kilometers) when she successfully flew directly through the heart of the storm and continued on to the coast of Suriname. Upinraaq on the MacKenzie River during the 2014 breeding season showing her bands and flag. Photo by Fletcher Smith. For generations, scientists have wondered how birds migrating from North America to South America during the height of the hurricane season. Do the birds fly around the storms? Do they die at sea? Do the birds have some way of predicting that storms are brewing and wait until the coast is clear? 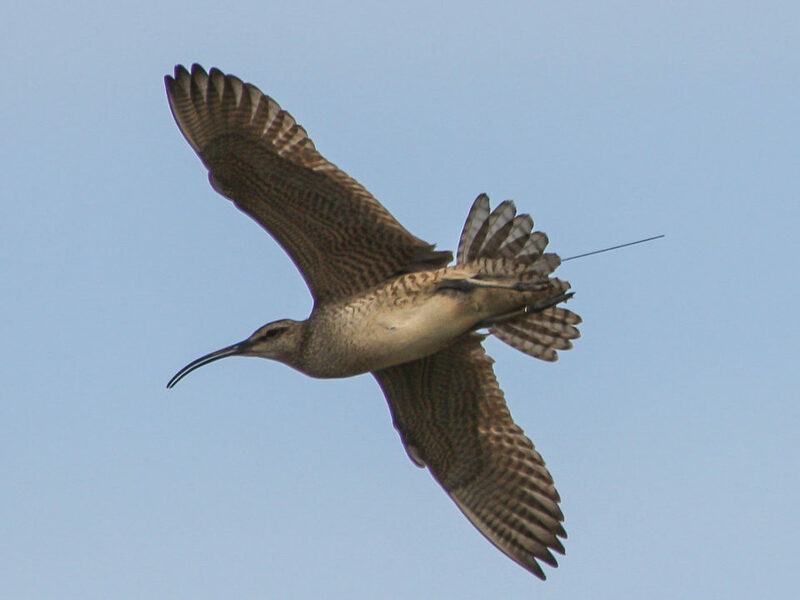 The rendezvous between Upinraaq and Erika represents the 9th such interaction between a migrating whimbrel and major storms that a tracking study has documented since 2007. 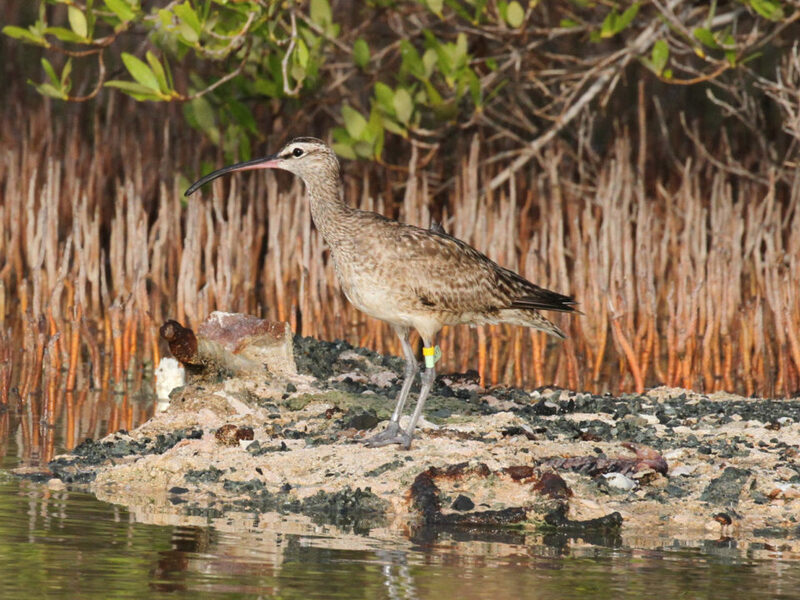 Information from 31 flights over the Caribbean and Atlantic Ocean is beginning to reveal the migratory behavior of this large, migratory shorebird. Birds launching out over the Atlantic from the high latitudes of the Canadian Maritimes appear to have no inkling about storms forming in the lower sub-tropical latitudes. Despite flying out over the vast Atlantic with no place to hide, no birds have been lost at sea. 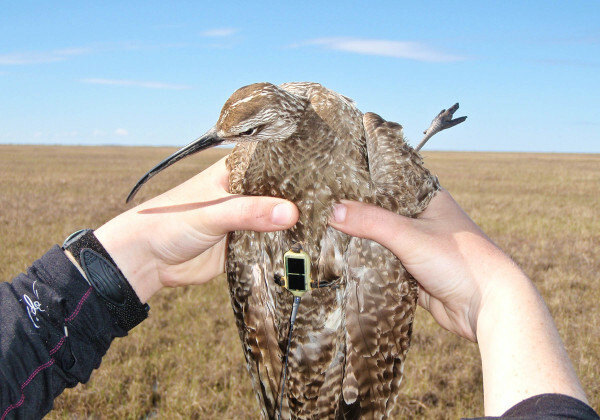 Christine Anderson, a shorebird technician working with the Canadian Wildlife Service holds Upinraaq on the breeding grounds while Fletcher Smith attaches satellite transmitter. Video by Fletcher Smith. Although several birds have skirted around major storms while crossing the Atlantic, 6 birds have flown directly through the storms. One of the most incredible of these encounters occurred in August of 2011 when a bird named Chinquapin flew directly through the northeast quadrant of Hurricane Irene, a monstrous storm that caused extensive damage along the eastern seaboard. 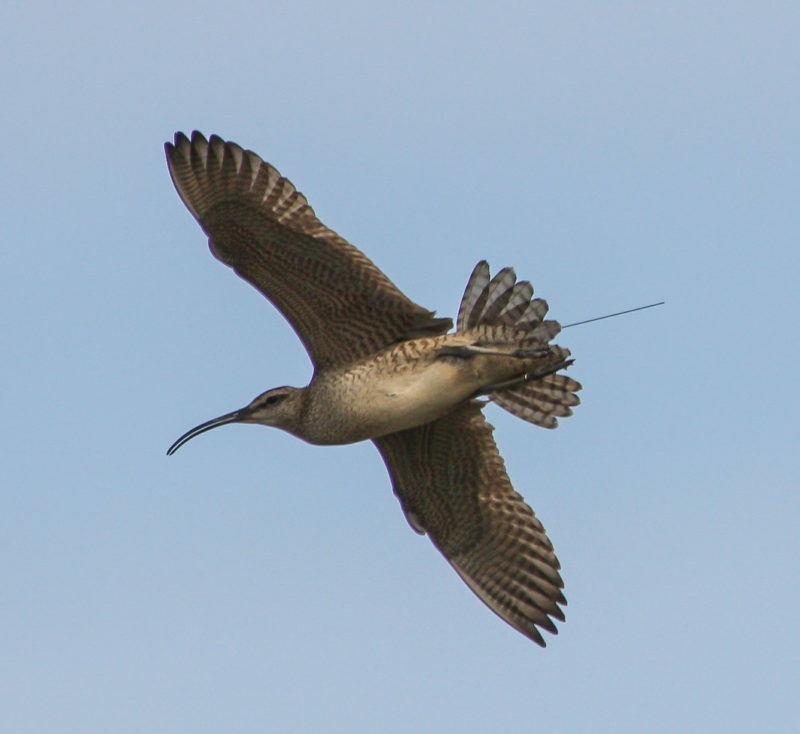 A second dramatic encounter occurred when a whimbrel named Hope flew through Tropical Storm Gert in the North Atlantic. This bird encountered high headwinds for 27 hours averaging only 9 miles per hour. Once through the storm, flight speed increased to more than 90 miles per hour as the bird was pushed by significant tail winds and made it back to Cape Cod, Massachusetts. In 2008, a bird was tracked into Hurricane Hanna and landed in the Bahamas only to be hit later by Hurricane Ike. Upinraaq wearing a 5-gram, solar-powered satellite transmitter. Photo by Fletcher Smith. Although Upinraaq survived her encounter with Erika, she was not unaffected. She made landfall near Paramaribo, Suriname roughly 1,000 miles west of her winter range in Brazil. She will have to run a gauntlet of hunters along the coast of South America to reach her winter home. Scientists will be tracking her progress in the coming weeks. Upinraaq breeds along the MacKenzie River in western Canada. 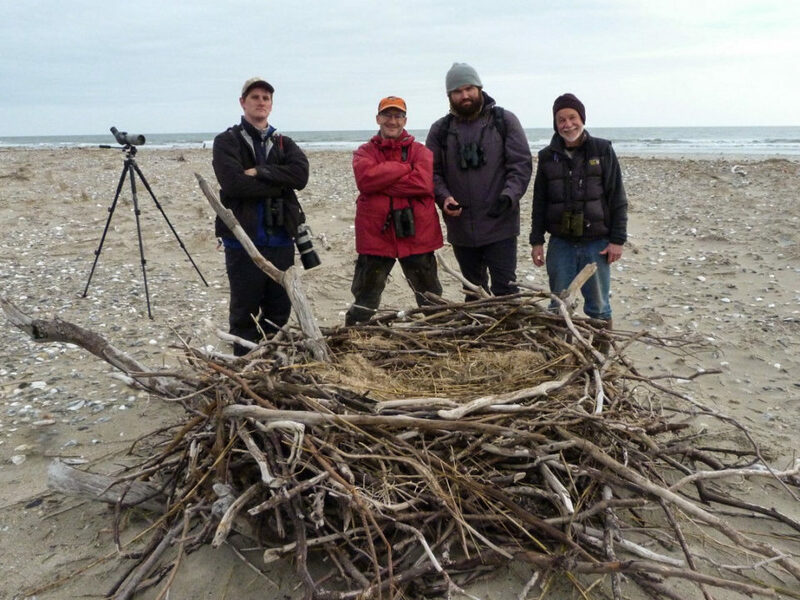 After the nesting season, she flies east to the Canadian Maritimes to stage for her long transoceanic flight to Brazil where she winters near São Luís and the Gulf of Maranhão. She leaves in the spring, flying to the Gulf of Mexico to stage before the long flight back to the breeding grounds. Christine Anderson releases Upinraaq after processing on breeding grounds along the MacKenzie River. Video by Fletcher Smith. 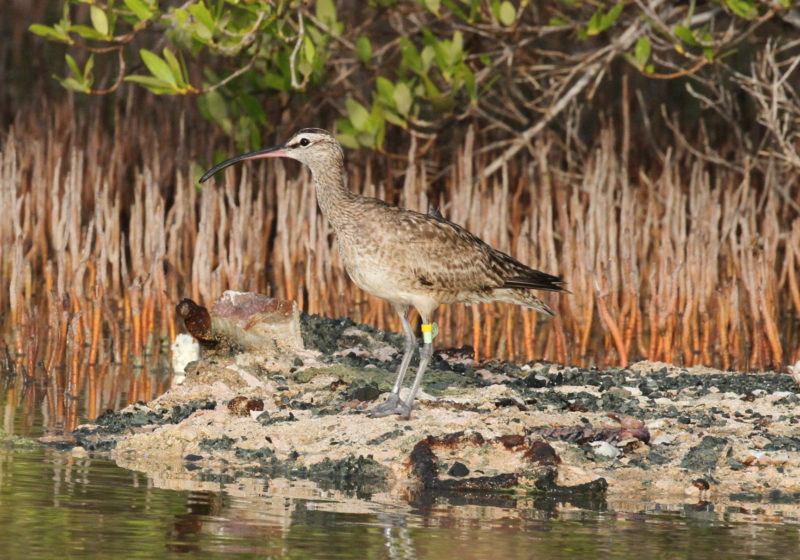 Migration route of Upinraaq the whimbrel through Tropical Storm Erika. Image of storm courtesy of NOAA. Data from CCB. 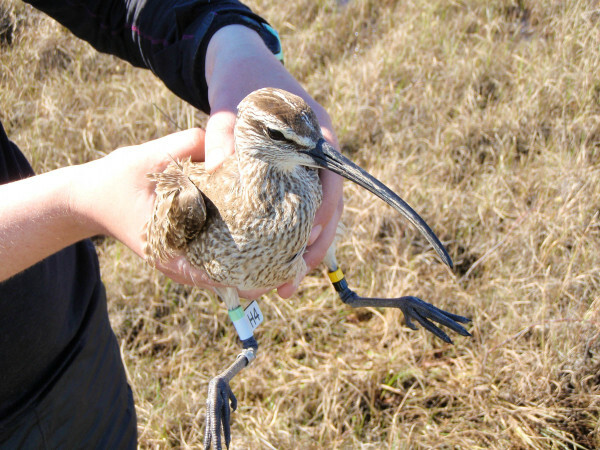 Upinraaq is one of 36 whimbrels that have been fitted with state-of-the-art satellite transmitters and tracked throughout their annual cycle to discover migratory routes that connect breeding and winter areas and to identify en route migratory staging areas that are critical to the conservation of this declining species. 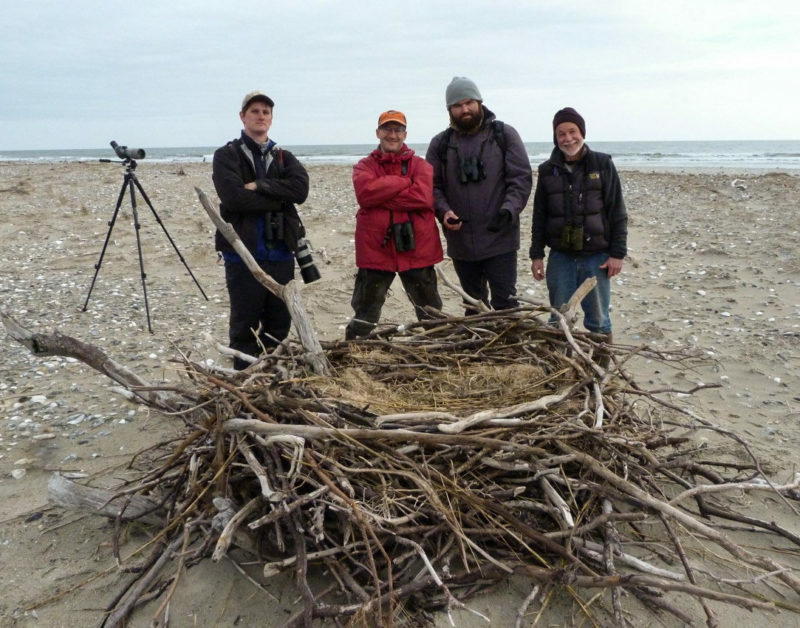 The project is a collaborative effort between The Center for Conservation Biology at the College of William and Mary – Virginia Commonwealth University, the Canadian Wildlife Service, the U.S. Fish and Wildlife Service, Georgia Department of Natural Resources, The Nature Conservancy, and Manomet.